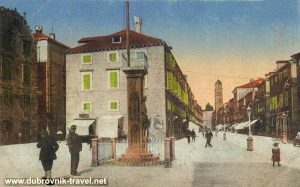 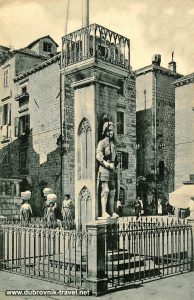 Orlando’s Column (Orlandov Stup) in Dubrovnik is a well-known monument situated in the very heart of the Old Town, in the centre of Luža Square right in front of St Blaise’s Church. 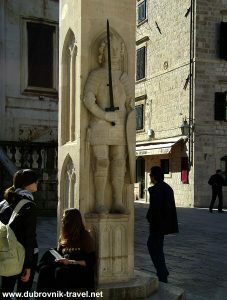 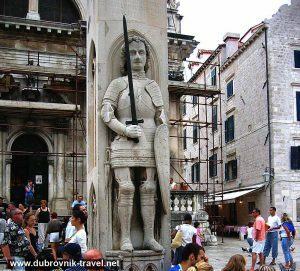 The column, erected in 1418, features armoured knight Orlando who according to the legend, helped the people of old Dubrovnik (Ragusa) defeat invaders in the middle ages and therefore helped Dubrovnik to remain a free trade city-state. 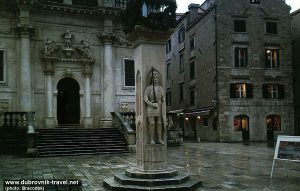 Being a monument to freedom, nowadays the column is also a flag carrier that features Libertas (freedom) flag of town’s Summer festival as well as St Blaise festival flag. 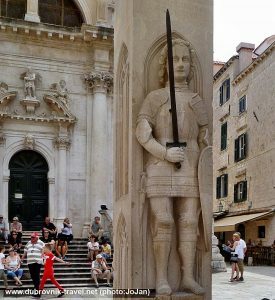 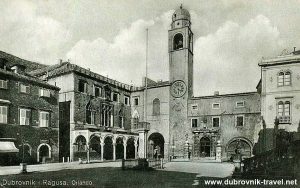 The Orlando’s forearm, 51.25 centimetres long was also at the times the standard Dubrovnik measurement for fabric where local merchants were measuring, cutting and selling fabric.